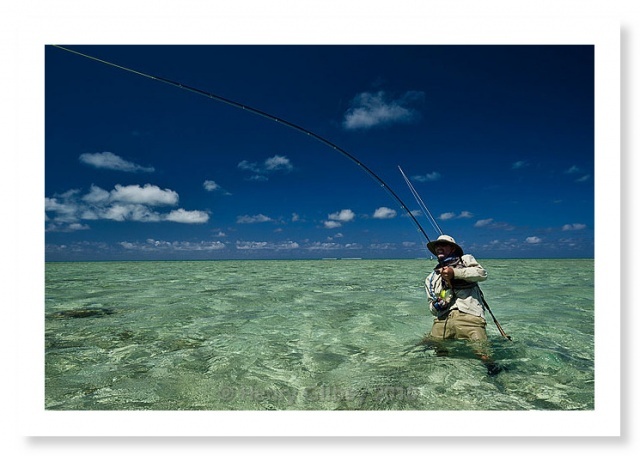 Now I would love to be able to say that "our" bass grow so big and run so hard that they produce this "flattening" effect on a rod when you play them, but in truth I mainly tend to see this thing happening out on the flats when an angler hooks a decent GT (or a bumpie, milkfish etc.) that runs and runs. This is not me merely dismissing our awesome bass, you guys know by now how much these things have got me so bad. It's merely an observation of mine. 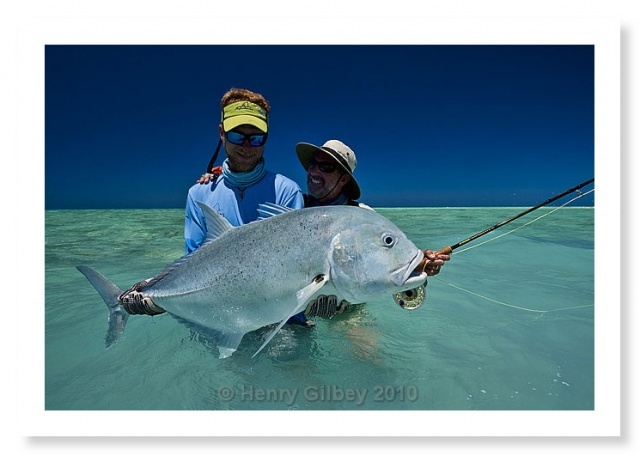 Look at the guy here and you can see what I mean - a big, heavy fish on a 12 weight fly rod that has very quickly taken lots of line, the angler has no option but to lean right back on the GT and literally hang on, and the rod then seems to "flatten" out at the top. I don't know enough about the physics of rod design, action or behaviours, but it always grabs me the moment I see a rod "flatten" out on a big fish. Now I have only ever seen this happen once on a bass, but I think it was the combination of what was perhaps a serious fish together with a very strong tide run. My mate Andy hooked a bass out in Ireland a couple of years ago on a MegaBass XLayer. We were all catching numerous bass say up to around 4 or 5lbs, but then he suddenly goes and hooks a fish that I could see straight away was something very different size wise. From memory I think Andy was using a Tenryu Red Dragon Express, a hugely powerful modern type bass lure rod as it is, but I always remember turning around to see the rod essentially "flattened" out at the top, with Andy leant right back into it. The bass was charging off down the tide and had taken a lot of line against a tight drag, but the hook then suddenly came out. We all spoke at length about what might have been, as you do of course, but personally I will always remember the angle of the rod. In my mind these rods are giving the impression of "flattening" out mainly because you have no choice but to use a lower rod angle on a big, running fish (it forces you down), and that must change the way a rod bends, or indeed looks like it bends. Put the rod nice and high like we are used to doing on smaller fish and all you are doing is tiring yourself out and putting virtually no pressure on a big fish. Granted, this is hardly a scientific study of big fish and how a rod reacts ! !, merely an observation of mine. 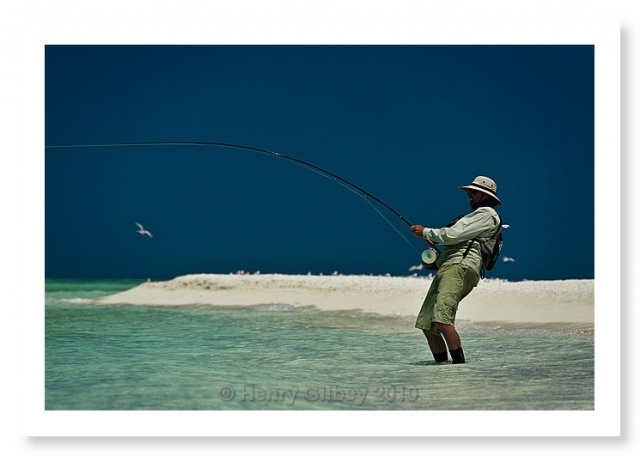 I do think that the only way that a rod is ever going to look like this on a bass would be a situation again exactly as I saw happen with Andy - a "big" fish in very strong tide, running against a tight drag. One day. It's going to happen again, indeed that is very much why we go fishing is it not ? Eternally optimistic. Anyway, this was another GT I saw taken on the flats out at St. Brandon's. I actually got a complete photo sequence of the angler stripping into this fish as it charged the fly down, but there is no point me posting the photos up here as you would need to see them large to get the proper impact. Every single time I see one of these awesome fish charge a fly down it leaves me with goosebumps. The gentle art of fishing ? Out and out savagery if you ask me, and I love it. I have put a brand new photo gallery up on my website from my St. Brandon's trip - check here. The outstanding online US magazine Surfcasters' Journal has just published a short photo essay of mine, have a look here and "flick" through the virtual pages. I am going to have to go and turn my cameras on those striped bass someday soon, they just look outstanding to me.